Disc herniations are a common cause of a wide range of issues including back pain, muscle weakness, and muscle imbalances. In many cases, symptoms may not be apparent until long after a disc herniation has developed. Spinal decompression is an effective and popular method to treat disc herniations and other issues. It can support the natural pumping mechanisms of the spine while improving the health and integrity of the intervertebral discs. 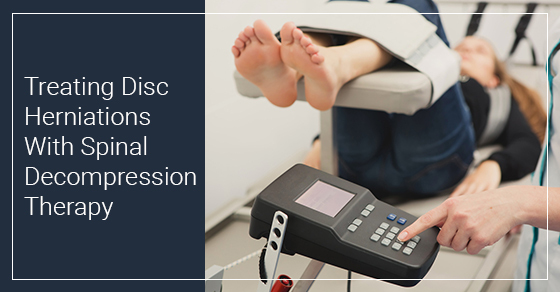 Disc herniations affect millions of people each year, and common treatment methods include physical therapy, pain medication, and invasive surgery. Nonsurgical spinal decompression can benefit disc herniations and help restore normal function of the spine. The technique works by stretching the spine and reducing the compression of the intervertebral discs. Physiotherapists use motorized decompression to apply the exact amount of movement necessary to improve the position of the spine. Reducing compression allows the discs to normalize their positions and reduce stress on the nerves and surrounding tissues. This improves the supply of oxygen, water, and other compounds to the discs. There are many health issues that can be treated through the use of spinal decompression. These include pain, sciatica, pinched nerves, degenerative disc disease, disc bulges, and disc ruptures. Patients are fully clothed during the treatment, and the physiotherapist can apply a specific amount of decompression. This makes it a customizable treatment that provides the best results for your needs. Spinal decompression treatments can be completed in 45 minutes or less. A series of treatments is optimal for ensuring that you get long-term results. Your physiotherapist will help you determine the number of treatments that will be required in your case. Physiotherapists can combine spinal decompression treatments with other techniques such as hot or cold therapy, electrical stimulation, and ultrasound. Non-surgical spinal decompression must be applied correctly in order to achieve results. Patients should schedule a consultation with their physiotherapists to determine the best options for treating their disc herniation. Issues related to pregnancy, bone fractures, osteoporosis, spinal implants, among others may prevent some patients from undergoing spinal decompression treatments. Your physiotherapist will answer all of your questions and determine if you qualify for the treatment. Spinal decompression therapy can treat disc herniations and other issues that cause pain, weakness, and loss of function to millions of people. Understanding how the treatment works is the first step to using it to improve your health and wellbeing.